There’s nothing quite like a new box of crayons. The deluxe box of 64 could send most kids into please-can-I-go-back-to-school-fit in mere seconds. Still to this day, there is something so comforting and promising about a new box of crayons. The chance to create something beautiful, something original, something oohed-and-ahhed over. One flimsy box of wax and color dye made the world seem more exciting and possible. I guess that’s why I love coloring so much. If you know me at all, you know that I’m no artist. My students used to laugh at my stick figures whenever I was forced to draw them on the white board during a lesson. However, give me a coloring sheet with lines and a pre-printed picture and I was good to go. My color scheming could work magic, and I just like any other kid in class could produce something worth hanging on the refrigerator. 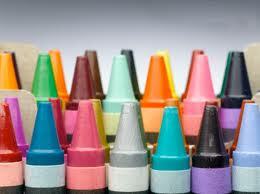 A person’s coloring years are usually limited to elementary school. If you are lucky you had some upper level teachers that required you to color for some school project. But for the most part, after elementary school, coloring becomes a things of the past — that is until you have your own children. Suddenly, you find yourself browsing through the school supplies aisle for that infamous box of Crayolas. Then you head to the coloring book aisle to select a cartoon-themed book for your little one to practice their staying-in-the-line skills. You rush home, lay out all the coloring necessities, and let your little one color to their heart’s delight. Soon though you hear a voice, “Mommy, color with me.” Behold, an excuse to revert back to those days of simple creativity. Even in the inconvenience of it all — dishes need to be done, laundry folded, dinner cooked — you take a moment to relax and just color. To visualize something beautiful but so simple. Before you know it, the weight of the world has rolled off your shoulders and vanished into a crayon. A little piece of color magnificence has bloomed. Life can continue on now, but you’re a little better off simply because you took time to color. I came across these adult coloring pages recently, thought about the serenity of coloring for a couple of days, and then went back to print out a few for myself. Although it seems childish to spend time coloring, I find that my soul longs for the simplicity of it all, for the nostalgia of being a child whose only care was staying between the lines and making appropriate color selections. Beside me, sits a new pack of colored pencils (hard to find Crayolas in the jungle) and a stack of coloring pages designed just for us big kids. Today, I will take a moment and create something colorful only for the opportunity to let the stresses of adult life disappear into the familiar lines of a color page. Maybe you should join me? Which childhood practice do you think would most benefit adults in our everyday life? This entry was posted in Memior, Women's Issues on August 13, 2012 by aliciachall28.